A bridge is a fixed dental restoration that replaces missing teeth. It is secured by being cemented and permanently attached to neighbouring teeth or implants. Bridges are made out of a different number of materials including gold, porcelain fused to metal and all resin based. They have a number of advantages over removable partial dentures, the main one being that they are fixed and cemented on to teeth in the mouth and that there is no coverage of the palate or roof of the mouth. 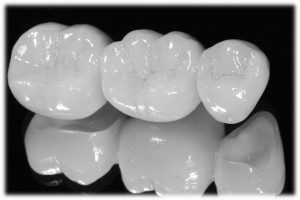 Following tooth preparation at an initial visit an impression is taken and that impression is sent to a dental laboratory where the bridge is constructed by a dental technician. At the second visit the bridge is fitted and cemented into place. For further information give us a call on 0151 722 6500.